Volkswagen Malaysia recently introduced a new special edition model of the Polo, called the Polo Black and White. The said special edition Polo model is built in collaboration with Lazda and is limited to only 11 units. Priced at RM 68,488, the Polo limited edition trim was exclusively available on Lazda, and Hong Leong Bank also offered a special interest rate of 1.111 percent (annually for five years) on the deal. Based on the Polo 1.6 Comfortline, the Polo Black and White is also powered by a 1.6-litre naturally aspirated 4-Cyl gasoline mill that’s mated to a 6-speed automatic transmission. This mill churns 105 PS and 153 Nm of power and torque, respectively. Before this, the company also introduce Polo Comfortline Vienna trim in Malaysia. Priced at RM 76,228, the car gets a spec sheet similar to that of the standard Comfortline. A few additions include Vienna leather seats, single-zone Climatronic climate control system, 15-inch Riverside alloy wheels, App-Connect, and more. Have a question on Polo? Polo is available in 4 different colors - Candy White, Reflex Silver, Flash Red and Carbon Steel Grey. Watch latest video reviews of Volkswagen Polo to know about its interiors, exteriors, performance, mileage and more. Volkswagen Polo has got a rich history of its own. From the year when its production began to today’s time, the Polo has seen many revisions and upgrades to make it that much more suitable and applicable to the changing market and people’s needs. Today, the Volkswagen Polo is in its sixth generation and it still continues to lure in more and more customers every year. As for the Malaysian market, the Polo is available in two variants and a single engine option - 1.6-litre 4-cylinder petrol engine. VW has introduced the Polo JOIN model that is a bit on the expensive side and offers a few more added features. The all-black theme in the Polo’s cabin makes it very sporty. The seats are very comfortable and supportive. 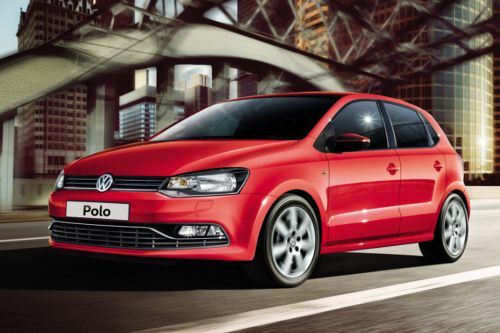 If you want a bit more luxury then you can opt for the Polo JOIN model that includes 'Vienna' leather seat upholstery. There is ample amount of space at the front and the space at the rear is also decent. The three-spoke steering wheel is very nice to hold and feels sporty. Behind it is a nicely designed instrument cluster that keeps you updated with relevant vehicle information at all times. The dashboard layout is very simple. The red font on the buttons on the centre console is a nice touch. There is a 6.5-inch touchscreen entertainment system that features connectivity options like Bluetooth, AUX, Android Auto, Apple CarPlay and MirrorLink. Despite having a restricted amount of space for the rear passengers, Volkswagen has kept the comfort level in check. Not only the seats are nicely contoured and comfortable, but there is also a rear AC vent. That is a welcoming feature. How many hatchbacks in this price range offer this? The current generation Volkswagen Polo is the best looking model ever. VW has done a tremendous job in keeping its design as contemporary as possible without compromising its style and attractiveness. The front of the Polo features a pair of headlamps that are so popular among the car enthusiasts that they instantly recognise it is a Polo. Also, the front grille is very minimalistic with a few horizontal chrome slats joining the two headlamps and VW badge sitting in the middle. The bumper has been given a similar layout. From the side, the Volkswagen Polo is very proportionate and classy. There is no drama whatsoever. The design is just plain and simple and doesn’t stop to attract you. We really like the silver alloy wheels on the red colour Polo. Moving towards the rear end of the car, you would find a couple of small tail light cluster that fits the overall rear dimensions perfectly. The Polo has got a multi-personality. It can be a calm, family hatchback on a day-to-day basis. And on the weekends or when you’re driving it solo, it can turn into this fun-to-drive car. It is quick, agile and exciting. Volkswagen didn’t want the Polo to be boring. Even though it kept things very simple in terms of looks and design, underneath the skin this hatchback is a completely different story. Under the hood of the Volkswagen Polo is a 1.6-litre 4-cylinder petrol engine that has been tuned to produce a total of 105 PS of max power at 5250 revs and the peak torque of 153 Nm is generated at 3800 revs. Just like the engine, there is only a single transmission option - a 6-speed automatic unit. Volkswagen has tuned both the engine and transmission to work in unison to provide an optimal driving experience without compromising on the fuel efficiency. VW claims that the Polo is capable to give a fuel economy of 15.8 kmpl. Considering this and the large fuel tank, the Polo can provide you with a range of around 700 km on a tank full. The build quality of the Volkswagen Polo is rock solid. The use of high strength steel with crumple zones in the car’s structure clearly shows that safety is among the top-most priority for VW. The list of safety features for a car at a price point like this is pretty decent. It includes Anti-lock Brake System (ABS) with Brake Assist (BA), Anti-pinch windows for all 4 doors, Child seat anchor for child seat system ISOFIX, Electronic anti-theft immobiliser, Front Airbags, Intelligent Crash Response System (ICRS), LED third brake light, Safety-optimised front head restraints, Triple flash lane change indicator, and 3-point seat belts for rear occupants. A powerful and fuel efficient engine, sporty yet elegant looks, attractive interior with a good amount of luxury, fun and exciting to drive, a good number of safety features; we think the Volkswagen Polo is a complete package. There are two variants available - COMFORTLINE and COMFORTLINE VIENNA - starting at a price of RM 74,990. And for those customers who always want a bit of extra, the Polo JOIN would be a good choice. It offers added features which include Black trunk garnish, Black rear spoiler, Leather seats, Black body side mouldings, Aluminium side scuff plates, Window film by VW Tint, 'JOIN' Emblem. Of course, you need to pay extra for this. What are the Safety Features Available in Volkswagen Polo?